What if you already had a tool that gave you a plethora of detailed information on your customers – what they find interesting, what annoys them, and when, where, and why they’re buying your products or services? This would be incredibly valuable to your marketing. You could turn repeat customers into brand evangelists, and start connecting with the new prospects who are most likely to adore your offerings. This tool exists, and it’s your CRM. Your CRM is essential to the success of your sales and customer service efforts. But your CRM has another incredible power: it provides invaluable insights into your customers’ interests, personalities, and behaviors that can supercharge your marketing strategies. Unfortunately, whether due to the learning curve or overwhelming amount of data available, many businesses (both large and small) are under-utilizing their CRMs in their marketing. Don’t be one of them! 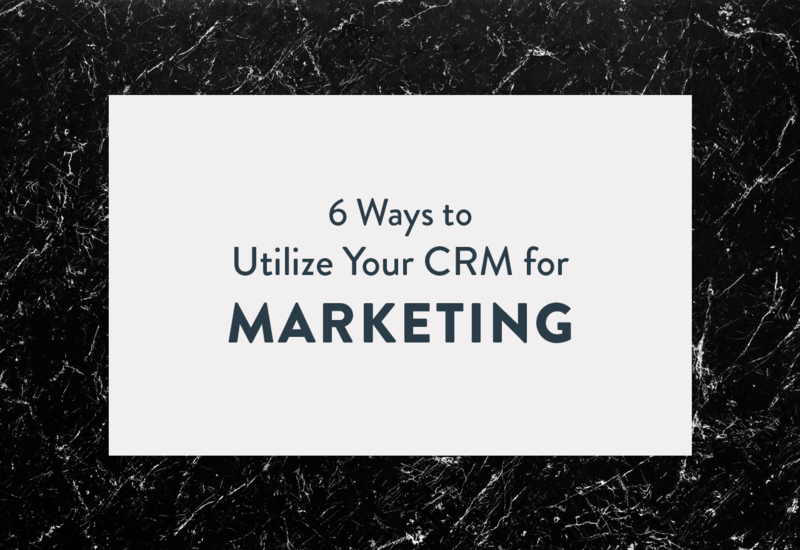 Here are our top six tips for getting the most out of your CRM in your marketing efforts. Refocus your training and onboarding process. Humans are resistant to change, even when the change is something that will make life easier – like a powerful new CRM. And even those employees and contractors who do appreciate the value of your CRM are still prone to error, meaning they may not always use your CRM consistently. The solution is both to create a consistent training program for new hires and existing team members and to establish a list of rules or best practices for using the CRM. Your training program doesn’t need to be elaborate, either. Create a series of short video tutorials on key aspects of how your business uses your CRM. Supplement this with a “cheat sheet” for busy salespeople and contractors to make it easy for them to follow your best practices. And remember, even the best-laid training plan is a waste without follow-up: either you or another team member should be responsible for enforcing these changes. Storing all of your customers’ data in one place (your CRM) is a good first step. However, you’ll start to see truly significant ROI when you use that data to personalize your marketing content. Use grouping, tagging, and segmentation to assign meaningful labels to your contacts. Then, sync up with your marketing team to develop personas based on these demographics – and use them to guide the creation of your marketing content. Sync CRM data with your website and landing pages. You can learn a lot from studying user behavior on your website. Imagine one of your contacts views your “pricing” page three times in a day, but soon forgets about your product and continues researching competitors. By contrast, imagine you’ve set up your CRM to send an automatic follow-up email to users who repeatedly visit your pricing page. Now, just several minutes after your prospect reads about your pricing, they receive an email from a friendly sales rep asking if they’d like to learn more. Behavioral data serves another purpose, too: it helps you understand which components of your campaigns are working and which aren’t. Study bounce rates, average session time, click through rates, pageviews, and pages per session to identify opportunities for improvement. Use the data in your CRM to create one (or several) customized email drip campaigns based on your subscribers’ unique interests. For example, if you’re sending out a newsletter to all contacts, make note of how they respond. Who’s opening your emails, and who’s clicking? Target those leads with a middle- or bottom-funnel email drip campaign to move them from prospect to customer. For more on creating effective drip campaigns, check out our blog post on the topic. Import and sync your contact data across all channels. Your CRM isn’t just a place to store data from your email subscribers. Maximize your reach by syncing your CRM with all channels where you make contact with new leads – from your personal and professional email accounts to those of your sales team. You can even download contact information from LinkedIn and other professional networking sites and add that information to your CRM in order to grow your reach. Most CRMs have some degree of automation capabilities, whether it’s email marketing automation or reminders sent to your sales team to follow up with specific prospects. Study the automation features of your CRM, and if you’re in need of more, use a tool like Zapier to set up workflows that serve your unique organization. Your CRM is a goldmine of information that can teach you how to better serve your current and future customers. Though it will take time to adapt it to your particular needs, it’s well worth the investment in the long-run.